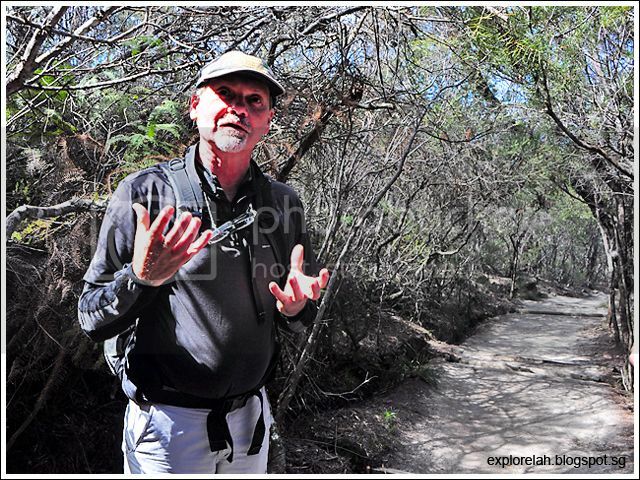 "Blue Mountains is not a mountain," declared Tim Tranter, our veteran bush walking guide. "Because there are no peaks here, but a series of plateaus." If he had his way, he would rename this central green lung of Sydney the "Uplifted Blue Dissected Plateau". It is a mouthful, but that's really the most technically apt description to contain the majesty of this geographical charmer. Mountains vs. Plateaus... Unlike mountains which are formed by tectonic plates collision resulting in a landform with sharp peaks, plateaus are formed either by a land mass being squeezed on two sides by tectonic plates causing it to rise, or by the erosion and weathering of a mountain peak into a flat summit. And when glaciers and water carve through the plateau and fragments it into several 'mountainous' table-top land masses, it is known as a dissected plateau. Which is the case of the Blue Mountains. ... Tim Tranter of Tread Lightly Eco Tours. A former fireman, Tim has been traversing the mountain trails for over 50 years and assisted in numerous mountain rescue missions. There are around 300 rescue missions annually to recover lost trekkers and those unfortunate enough to meet with accidents. We sure feel safer with him leading the way. His depth of knowledge about the mountains and passion in sharing the area's geography, ecology and features are both enriching and inspiring. 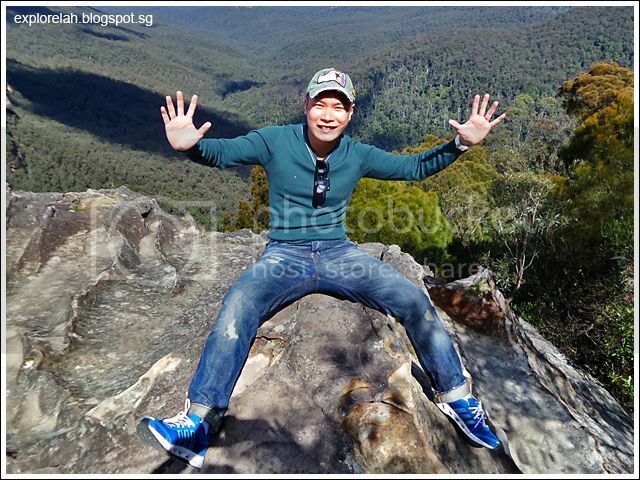 We became quite the mini experts on Blue Mountains after an hour's bushwalk with him. 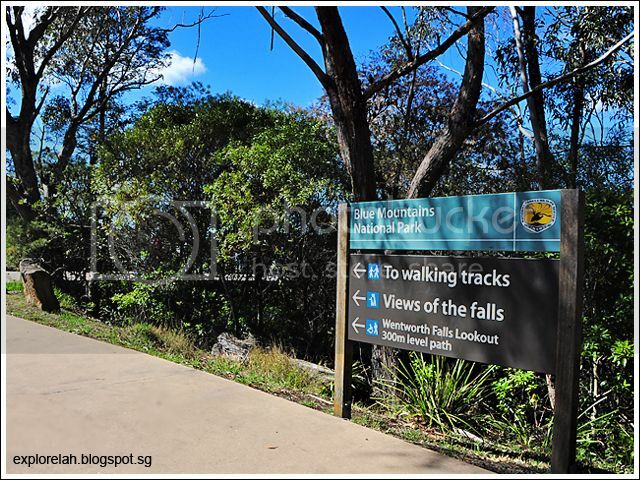 There are around 80 buskwalking tracks in 13 zones around Blue Mountains. A track can span anything from 0.25km to a lookout point to a glutes busting 8km one-way trek through forests, waterfalls and cliffs. If you love long walks, this is mecca for those trekking shoes. Click here for a list of Blue Mountain walking trails. If you are unfamiliar with the trails and terrains, it is best to engage a licensed guide to show you the way so that you don't end up as a rescue mission. As we are pressed for time, we took the track from the town of Wentworth Falls that leads to the said waterfall. We didn't go all the way to the waterfall, which would take about 2 hours, and ended up at the Princes Rock Lookout point (20 minutes trek from this sign). No, that's not an orange toilet brush displaced on a tree. 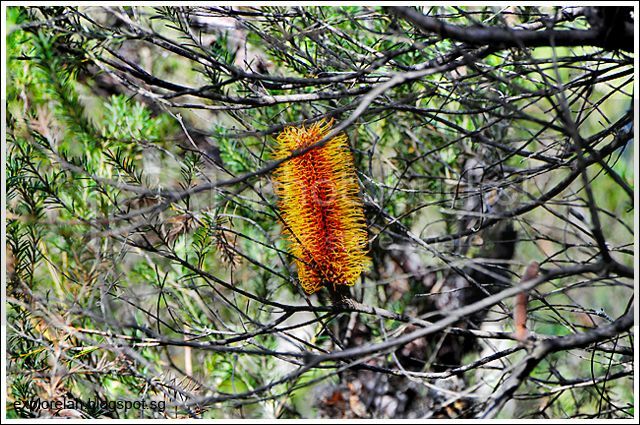 It is one of the plants we encountered plenty of during our walk and it's called Birthday Candles (Banksia Spinulosa). Is there a plant called Birthday Cake? 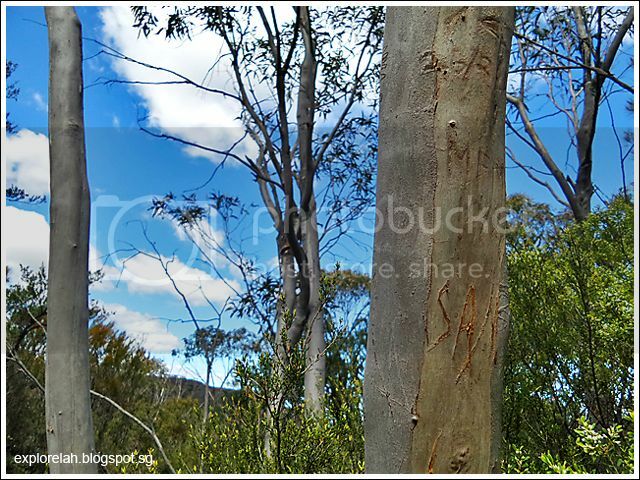 Eucalyptus trees are the chief foliage here and covers most parts of the Blue Mountains. The trunk is actually cold, the bark smooth and its leaves are oil rich. These properties make them resistant to fire and the Blue Mountains is the birthplace of this aromatic plant species with various genus originating from this rocky cradle. 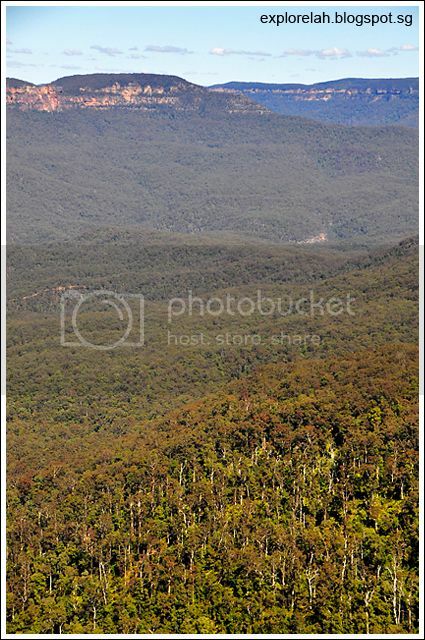 The abundance of eucalyptus is also why the mountains is blue. What a minute, am I colour blind? The plains and plateaus are clearly green from the leaves and foliage. But take a look further into the valley and you'll notice a blue tint in the atmosphere. It is believed that vapours of eucalypt oil dispersed into the air causes a refraction of scattered rays of light which are mostly blue in colour. And that causes the surrounding area to appear blue to the eyes so the name, Blue Mountains! I wonder if we'll turn into Smurfs from inhaling too much of the blue air. 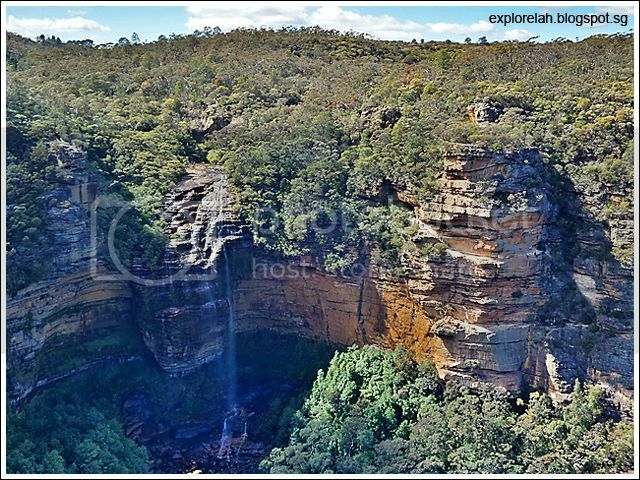 Approximately 10,000 square kilometers of the Greater Blue Mountains Area was listed as a UNESCO World Heritage Site in 2000. 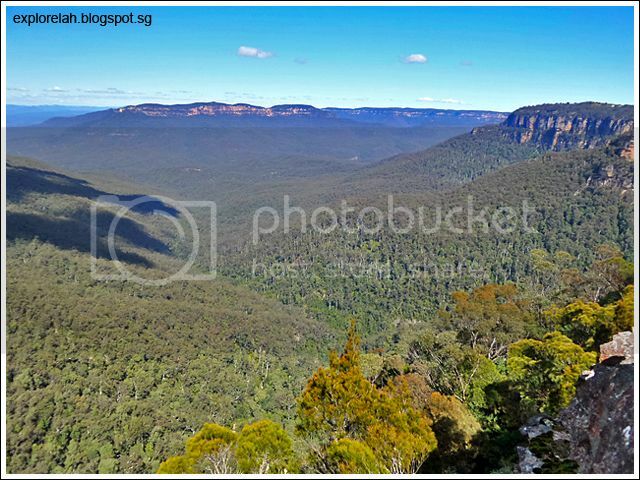 The sites included 7 national parks (Blue Mountains, Wollemi, Yengo, Nattai, Kanangra-Boyd, Gardens of Stone, and Thirlmere Lakes) and the Jenolan Caves Karst Conservation Reserve. Its admission into the UNESCO list was largely thanks to the endemic eucalypt forests which contains all four groups of eucalyptus species, the highest in the world, as well as endangered species that are very old, serving as a living time capsules of vegetarian evolution in the area. 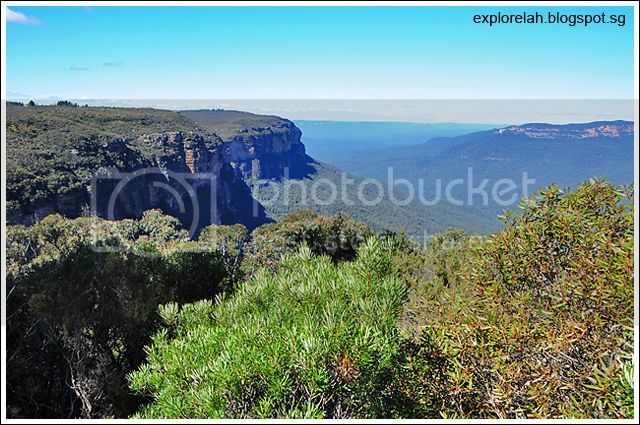 Apart from the blue, another amazing quality of the Blue Mountains forest is that it can renew itself pretty quickly. Can you believe that not too long ago, the scene behind me was not one of dense forestry but a brown and burnt piece of land? Remember I mentioned earlier that eucalyptus trees have evolved smooth barks and a cold trunk to better survive forest fires? Due to their resilience, they suffer little damage when a bush fire engulfs the forests and are able to quickly regenerate when the wet seasons return. Comparing the Blue Mountains plateau with other famous tablelands such as the parched, reddish Grand Canyon and the frost laden Tibetan Plateau, this lush green naturescape sure looks and feels friendlier. Feeling on top of the world at the edge of Down Under! 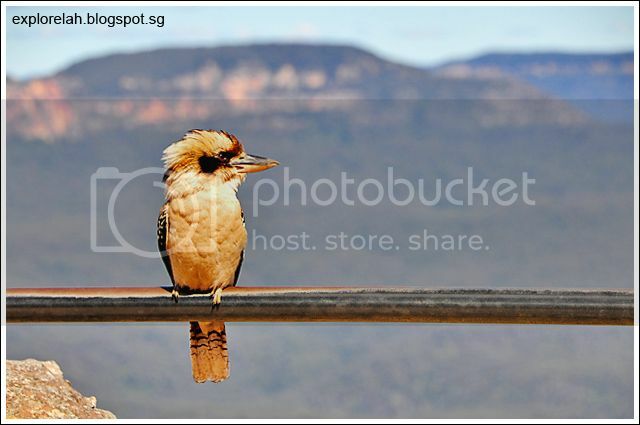 Stunning views all around at Princes Rock lookout point. 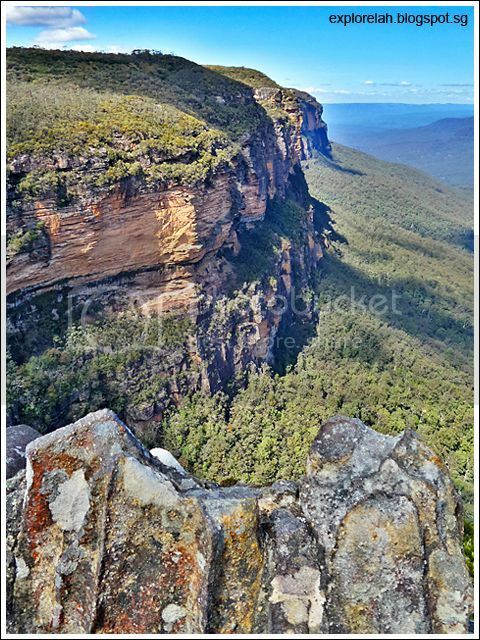 View of Wentworth Falls from Princes Rock Lookout point. 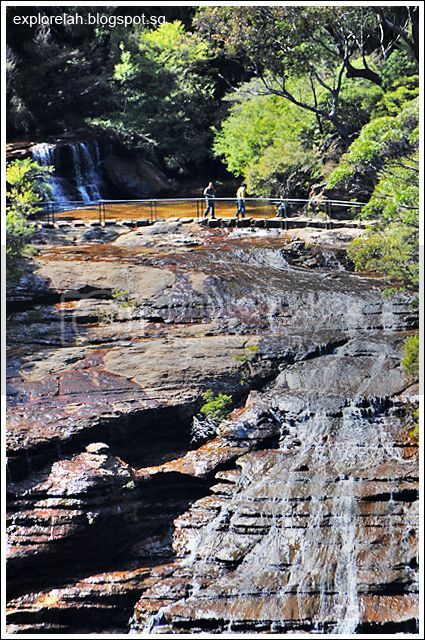 Trekkers crossing the Wentworth Falls. I'm drooling like the gushing stream in the photo for a chance to walk such a scenic route. The route leads on to Wentworth Pass where you get to walk through a rock-hewed passage next to the cliff. I imagine it would be a totally awesome experience so definitely opt for a half-day bush walking experience if you come this way in order to see more. 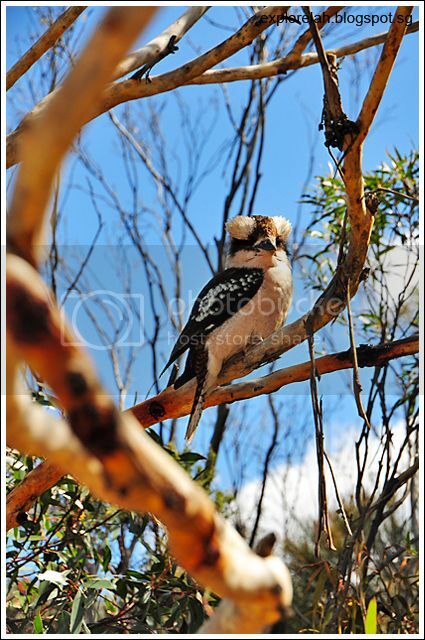 Our tea-break at Princes Rock Lookout was joined by an unexpected visitor... the Kookaburra! Terrestial tree kingfishers native to Australia and New Guinea, the Kookaburra is amongst the world's largest kingfishers. 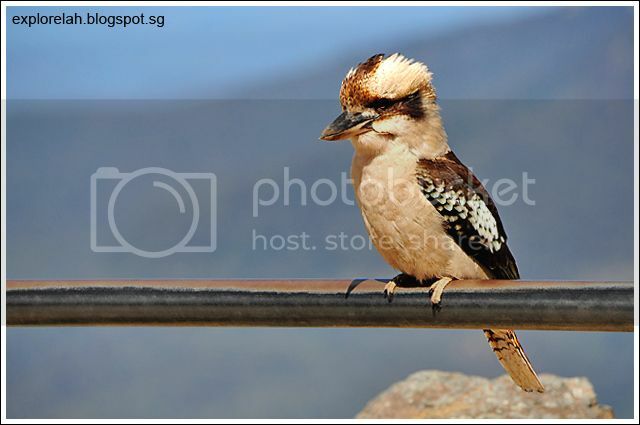 This fella really loves the camera and stood on the railing for a long time to satisfy clickaholics before perching on a branch to continue being adored by our cameras. 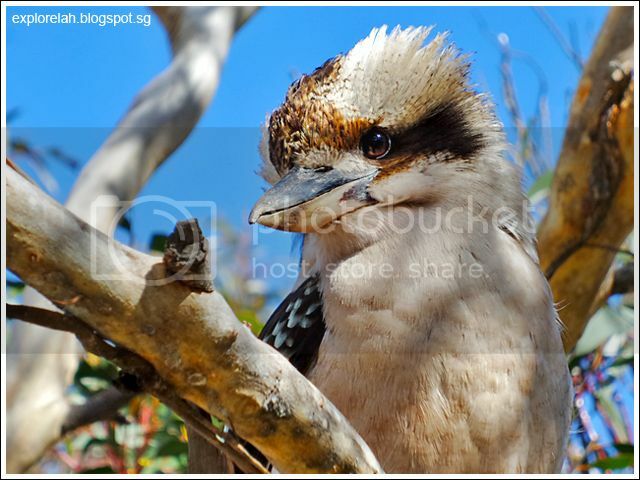 Kookaburras are known to be rather friendly towards humans so I was able to get rather close to take photos. This shot was taken with my mobile phone. This feathered critter is such a beaut! Loving it at the Blue Mountains! 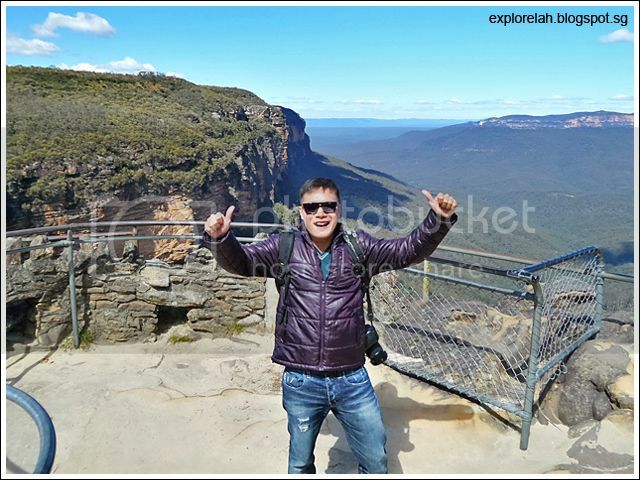 Many of us overseas tourists usually come to Blue Mountains as a day trip, a touch-and-go destination to rush through in a list of attractions and experiences to cover in Sydney. 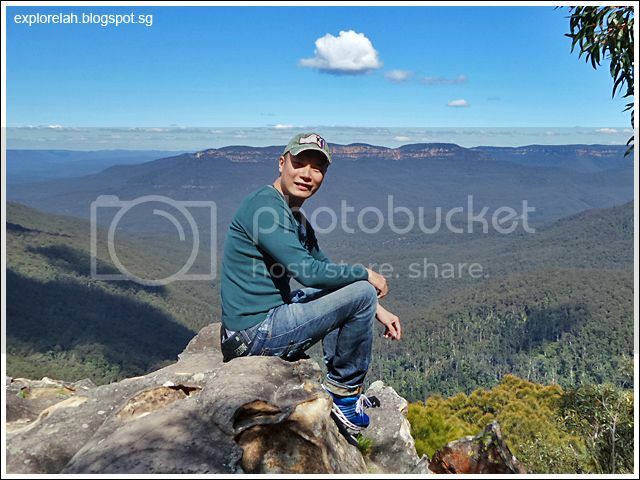 Having been to Blue Mountains twice, once as a day trip in 2012 and this time with a 1-night stay over, I definitely preferred the longer stay to get better acquainted with the breathtaking landscape and its mysteries. Even with two visits, I've barely touched the missing tip (no pun intended) of the mountain with so much more to explore about the vast region's flora, fauna, geography and indigenous heritage. Being within close proximity to downtown Sydney (only about 70km away), Blue Mountains is a wonderful retreat to escape the city blues (pun intended)!